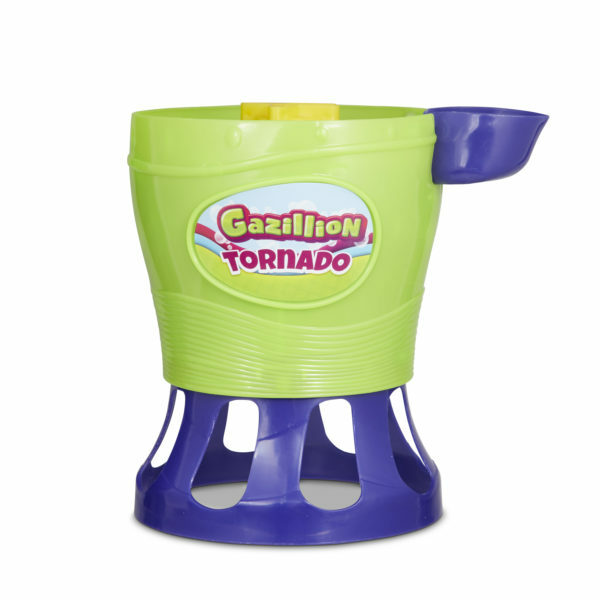 Instantly create a bubble storm with the Gazillion Bubbles Tornado! With no pump and no wait time, you’ll be creating a gazillion bubbles in a flash. This ultimate bubble machine blows 4500 bubbles per minute at the push of a button! Simply attach the auto-feed valve cap to the solution bottle, insert the bottle into the spout, push the button, and watch in amazement as a Tornado of bubbles blows into the sky! The Gazillion Bubbles Tornado includes a 4 oz. bottle of non-toxic Gazillion Bubbles solution and an auto-feed valve cap. 4 AA batteries required, not included. Appropriate for ages 3 years and up.